I always admire your drawings, not always leaving a comment. But I see and love them all! You've captured so much detail, great work! I am always so impressed with the lifelike quality of your pictures. I love pineapple and this one looks real enough to cut into and taste. As always, beautifully done. Such a complex fruit, well portrayed. Yummmmmmmmm. The purple shadow is lovely. This is fantastic! Great job on all the greens especially! I love pineapple to begin with, but this one looks really good, you got the colours totally bang on. I think this is fantastic, so realistic! 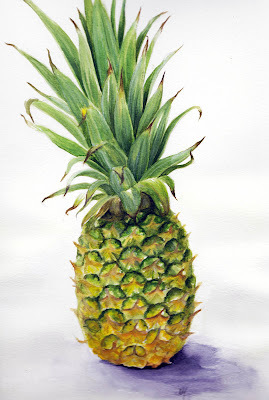 I always think pineapples are tricky subjects, so extra well dones to you for doing such a good job! Very very well done, Debra! Fabulous drawing Debra. I bet it was tasty. Ah, the pineapple is the symbol of welcome and hospitality (at least in the States). This one is a beauty. this is beautiful! now i want pineapple!!!! !